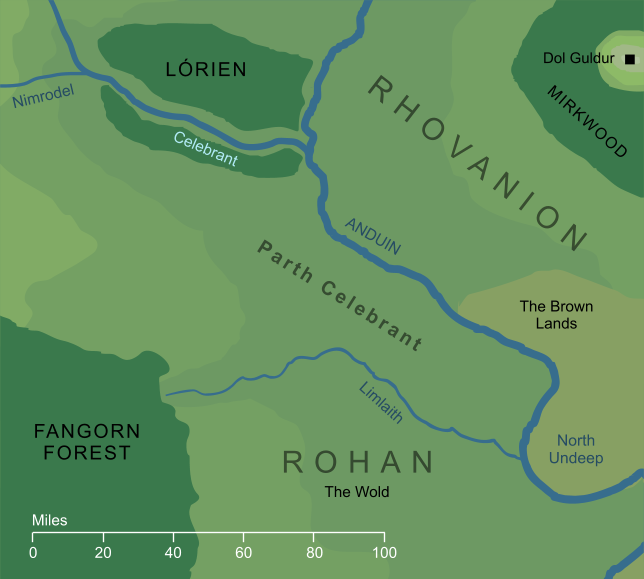 In ancient times, the borders of Lórien extended southwards as far as the River Limlight (which later formed the northern border of Rohan). The woods of Lórien were greater in those days than they later became, and the Galadhrim occupied the forests in much of the land between the Celebrant and the Limlight. They called this region Parth Celebrant, the Field of Celebrant. In later history, the woods receded so that the Celebrant lay close to Lórien's southern edge, and the Men of Gondor occupied the southern part of Parth Celebrant, so that the narrow area between the Anduin and Limlight became known to Men as the Field of Celebrant. To the Elves, though, the name Parth Celebrant referred to the entire grassy plain from the Limlight north to the Celebrant itself within Lórien's woods. Original content © copyright Mark Fisher 2009, 2017, 2019. All rights reserved. For conditions of reuse, see the Site FAQ.